DMG MORI SEIKI Australia displays its range of turning and milling solutions at the National Manufacturing Week (NMW) this year. Home > DMG MORI SEIKI Australia displays its range of turning and milling solutions at the National Manufacturing Week (NMW) this year. 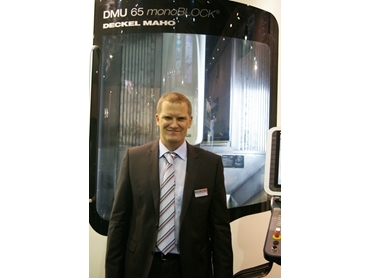 Dr. Jens Hardenacke, CEO - Cooperation Markets at DMG/Mori Seiki. German machine tool builder GILDEMEISTER AG commenced joint sales and services with the Japanese machine tool manufacturer Mori Seiki Co Ltd in Australia on 1 March 2010. The joint company DMG Mori Seiki Australia plans to increase its market share in Australia and New Zealand to more than 50% in the next one or two years, explained Dr. Jens Hardenacke, CEO - Cooperation Markets at DMGMori Seiki. DMG MORI SEIKI Australia proved to be very successful this year at that Austech and National Manufacturing Week (NMW) with more than 10 machines sold over the four days and over 1000 attendees visited their stand, and sought information on trend-setting technologies as well as on industry-focused solutions for the aerospace, automotive, medical and mining sectors. The array of machine tools presented by DMG/Mori Seiki was one of the eye-opening exhibits at this year’s Austech exhibition in Melbourne. Multi-axis machining centres in horizontal, vertical and universal configurations. Previously, the complexity and expense of 5-axis machine tools limited their application to only the most sophisticated and well-funded factories. Today however, the versatile machines are finding use in shops of nearly every size and description, and advancing technology continually improves their performance. The newly developed DMU 65 monoBLOCK, offering the entry into the high-tech world of simultaneous 5-axis machining, generated a lot of interest among visitors and was sold off the stand. The design of the economy version of the DMG turning and milling machines is based on the proven DMG quality at the best possible price by the combination of consistent standardisation, simple and reliable construction methods and state-of-the-art 3D control technology. While the universal turning machines in the CTX eco series have already become the international top sellers at DMG, the latest winning model in the ECOLINE world which was also exhibited at this year’s Austech exhibition is the new CNC universal milling machine DMU 50 eco. Mori Seiki’s recently launched NTX2000 high-precision and efficient integrated mill/turn centre also proved to be a crowd puller, as well as the NLX2500, the first model to be released from the new X-Class series – a CNC lathe packed with extensive features including high rigidity, measures against thermal displacement, energy and space saving, MAPPS IV + ESPRIT, and compliance with safety standards.